The Bhagavad Gita (Song of God) is the greatest spiritual book the world has ever known. It reveals transcendental knowledge spoken by the Supreme Lord Krishna Himself. 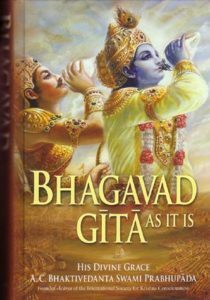 The Bhagavad Gita can be consulted in all critical times … for the way out of great entanglements, which may embarrass one in some critical hour (A.C. Bhaktivedanta Swami Prabhupada). A person who is not disturbed by the incessant flow of desires that enter like rivers into the ocean, which is ever being filled but is always still can alone achieve peace, and not the man who strives to satisfy such desires. Leo Tolstoy: Metaphysical religious idea of Krishna is the eternal and universal basis of all true philosophical systems and all religions. Albert Einstein: When I read the Bhagavad-Gita and reflect about how God created this universe everything else seems so superfluous. Mahatma Gandhi: When doubts haunt me, when disappointments stare me in the face, and I see not one ray of hope on the horizon, I turn to Bhagavad-gita and find a verse to comfort me; and I immediately begin to smile in the midst of overwhelming sorrow. Those who meditate on the Gita will derive fresh joy and new meanings from it every day. Henry David Thoreau: In the morning I bathe my intellect in the stupendous and cosmogonal philosophy of the Bhagavad-gita, in comparison with which our modern world and its literature seem puny and trivial. Dr. Albert Schweitzer: The Bhagavad-Gita has a profound influence on the spirit of mankind by its devotion to God which is manifested by actions. Adi Shankara: From a clear knowledge of the Bhagavad Gita all the goals of human existence become fulfilled. Bhagavad Gita is the manifest quintessence of all the teachings of the Vedic scriptures. TODAY’S TIP: As you might have noticed all quotes mentioned above are from the second chapter of the Bhagavad Gita. The whole book has 18 chapters and is an endless source of wisdom answering all questions you can think up.